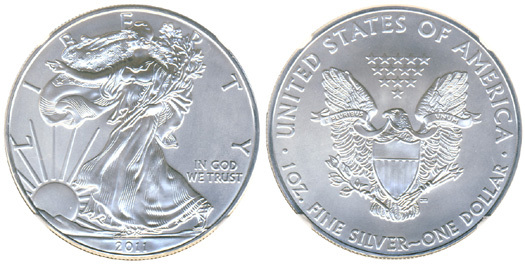 This page will cover the 2010 through 2003 releases of American Silver Eagles, and provide information about each edition of the coin. 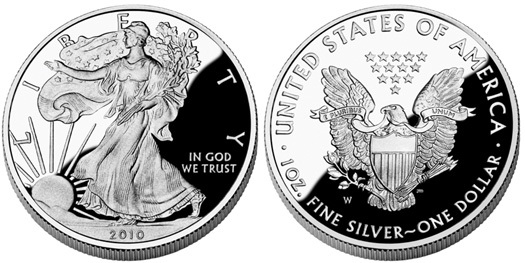 Although the bullion version of the Silver Eagles series was available early in 2010, the status of the proof version for collectors was not announced until November of that year. This left coin collectors wondering for the better part of the year about the fate of their coin collections. The release of the 2010 coin was pushed back due to the fact that the U.S. Mint was still busily printing coins to fill orders for 2009 coins. The minting of the proof version of the count was put off by the fact that the public had such a demand for the bullion. The Mint is required to meet the demand for bullion coins before churning out coins for collectors. Collectors feared that, as in 2009, the proof version would fail to be issued. This was not the case. The first proof coins shipped out in early December, and were priced at $45.95 per coin. The 2010-W uncirculated eagle was, however, canceled. The 2011 sales of the American Silver Eagle coin were quite impressive, with more than six million coins being sold in January alone. Sales were elevated for the entire year, although the mint was able to release both a collector proof coin and an uncirculated 2011-W coin, too. Amid high demand, many changes were undertaken by the U.S. Mint, including the addition of production for the line at San Francisco Mint in addition to minting at West Point. With the addition of minting in San Francisco, some third party grading services announced that they would encapsulate 2011 Silver Eagles that were struck in San Francisco. The coins did not have a mint mark or other identifiers, and the only way to buy one was to buy a Monster Box, which is a considerable investment of 500 coins. 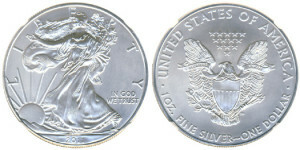 The year 2011 was a milestone for the Silver Eagle series, since it was its 25th anniversary. As such, the U.S. Mint released a special set of five different Eagle coins with two of the coins being versions that were not available outside the set. The set sold out within just hours of its release. It was limited to a run of 100,000 sets. With three years of demanding sales behind it, the American Silver Eagle series coin mintage began to slow due to decreased demand. By the middle of the year, sales of the series were reduced by around 22% from the same period a year earlier. The mint had also expanded a number of its collectible offerings in the series and was now offering three special sets for the collector. From the start of the minting year, the coins were produced at both the San Francisco and West Point Mint facilities with no mint marks. The first specialty set for 2012 was the San Francisco Silver Eagle set that commemorated the 75th anniversary of the San Francisco Mint. The coins were offered on demand, based on orders, and only for a limited time. One collector set offered in 2012 included the set of coins and currency that was entitled Making American History, that included a 2012-S proof Siler eagle and a five-dollar note with the serial numbers starting at 150. This set was issued as a commemorative set to mark the 150th anniversary of the U.S. Bureau of Engraving and Printing. Notably, a reverse proof was also issued for 2012. 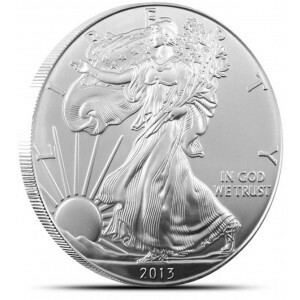 Orders for the 2013 Silver Eagle bullion coins were accepted by the U.S. Mint beginning in early January. This will be a continuation of a series that has been wildly popular since 1986, the inaugural year of the series. The long-running series features the Walking Lady Liberty on its obverse, a design by Adolph A. Weinman, and a heraldic eagle design on the reverse, a design by John Mercanti. Sales records for the series saw record-setting sales from 2008 to 2011, due largely to the fact that investors were turning to the safety of silver. Although demand dwindled in 2012, resurgence in interest in silver is expected as the final months of 2012 saw a slight upswing in sales. The Mint will also offer collector proof versions of the coin this year, as well as an uncirculated eagle that is poised to be released in May. Another summer offering from the U.S. Mint is expected with the West Point Silver Eagle set, which will be offered for a limited time to mark the 75th anniversary of the opening of the mint at West Point. Details on the commemorative set have yet to be released, although sales are slated to run from May through June.